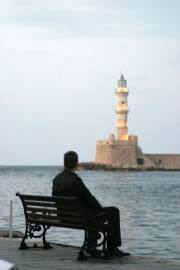 Chania (Χανιά) is a charming combination of the ancient and the modern. It's 'Old Town' centres on its Venetian Harbour with its narrow alleys and colourful houses and shops. The Old Town is divided into four quarters - Topanas, Evraiki, Kasteli and Splantzia. Behind the Old Town, the modern town of Chania is a bustling business and shopping centre with Greek and multi-national chain stores well represented. The Municipality of Chania has the largest density of population outside of Athens and Thessalonika and is home to many expatriates from Northern Europe. Chania, with it former name of Kydonia is mentioned by Homer in his Odyssey. Chania offers a wide range of accommodation. Crete's second largest airport is situated on the outskirts of Chania. Nea Xora (Nea Chora) is a sandy beach with shallow water of about 500 metres in length and 30 metres wide. 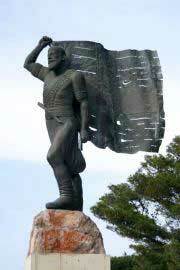 It has been awarded Blue Flag status. Suitable for families. It has ample facilities for sunbathing, swimming and watersports. There are many small shops and food and drink establishments within easy reach of the beach and a range of accommodation available. Access to the beach is facilitated by ramps. The beach can be affected by the Summer north winds. The natural environment of the area includes Palm-trees, Almirikia, Oleander and Lilacs. Throughout the year a programme of environmental activities take place including beach clean ups and cleaning of sea-bottom, workshops about the environment and recycling. Other events include a painting competition for primary school children. Nea Chora beach is found at the west of the city's Venetian walls. To the west of Nea Chora beach is a long sandy beach, quieter, less busy and with little in the way of facilities. Chania's third beach is not well frequented as it is not good for swimming due to local pollution. It has facilities for food and drink and accommodation. It is affected by the Summer north winds. It is situated east of the city's Venetian walls. 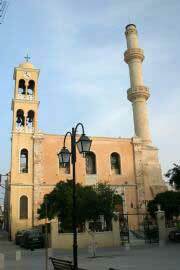 The Cathedral of Chania, Agioi Anargyroi Church, can be found behind the Odeon, a charming church. It was the first cathedral of Crete and the only one to continue functioning during the Turkish Ottoman occupation. The church contains superb Byzantine frescoes and icons; Saint Magdalene Church. Chania has been a place of settlement since prehistoric times. This was the site of the Minoan city of Kydonia (Cydonia) and even before this in Neolithic times, there were settlers here. Excavations in the district of Kasteli have yielded a large amount of archaeological evidence supporting the importance of the Minoan Kydonia and the earlier Neolithic inhabitants. During the Classical period, Chania was an important city state in ancient Greece. It was at this time, around 1100BC, that the Dorians from northern Greece arrived bringing their culture with them. The city-states of Crete were constantly at war with one another and Kydonia was no exception, with many disputes with the neighbouring city-states of Aptera, Falasarna and Polyrrinia. During the Roman occupation of Crete, which began around 69 BC, Kydonia was given the privileges of an independent city-state and the right to mint its own coins. This continued well into the 3rd Century AD. In the first Byzantine period (395-824 AD), Christianity became well established across Crete. The Arab invasion in the 9th Century saw the introduction of a different culture and a different religion. Persecution of the Christians was widespread and they became displaced from their normal places of settlement to continue their way of life and their religion in isolated mountain regions away from the Arab centres of population and their influences. At the fall of the Byzantine Empire in this area, after the Fourth of the Crusades to the Holy Land (1204 AD), the whole of Crete was given to Bonifacio, the Marchese of Montferrat. He sold his prize for 100 silver marks to the Venetians, marking the beginning of Venetian influence on Crete which was to last for around 400 years. By 1252 the Venetians had estabished their rule over Crete, having subdued the local population but the Venetians were challenged by their rivals the Genoans, who with the support of the local Cretan population, took Chania in 1263 and held it for twenty two years until 1285, when the Venetians returned in force to reclaim it. The Venetians made Chania the administrative centre of the region, establishing it as the seat of the Rector (Chief Administrator). attempt to influence the religious practices of the Cretans, allowing them to continue practising their Greek Orthodox church doctrine. The Venetians had a significant effect on Chania and its culture and much remains today from that period. A further addition to these influences was made in the mid 15th Century, after the fall of Constantinople, when Crete saw an influx of artists and monks from the north. The combination of Greek, Byzantine and Venetian cultures made a major contribution to the Arts and the growth of intellectual activities flourished as a result. converted to mosques. The Turks established themselves in the quarters of Kasteli and Splantzia, which became predominantly Turkish in nature with the Church of Saint Nicholas being converted to the Mosque of Houghiar Tzamissi. 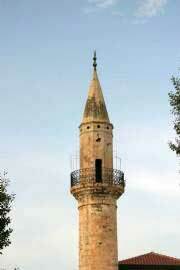 Today, you can still see that the building has both a Christian bell-tower and a Muslim minarette. The Turks had an extensive building program and built many new mosques including the one which stands at Chania's old harbour, the Mosque of Kioutsouk Hassan Tzamissi and other public buildings such as Public Baths (Hamam), fountains and gardens (Kipos). After nearly 200 years of Turkish occupation, the Cretan population began the process of breaking the yoke of Turkish rule. In 1821 as Greece challenged Ottoman rule, conflicts became bloody with the Turks taking harsh reprisals against the Cretans and their struggle for freedom. No one was safe, regardless of rank or position and even Bishops were executed for their part in the revolution. The ensuing conflicts and resultant instability prompted many Turkish families to leave Crete and return to Turkey. However, some remained until as late as 1923. A new era of Cretan history opened with the struggles against the Ottaman Empire in the late 19th Century, with one of Crete's most famous sons, Eleftherios Venizelos, born near Chania, in the forefront of activities. Leader of the 1896/7 uprising against the Turks, Venizelos went on to unite Crete with the rest of Greece in 1913 after he became Prime Minister of the Greek nation in 1910. In the interim period between the end of Turkish rule and Crete's unification with the rest of Greece, Chania was important as the capital city of the Cretan state. At this time Crete had its own currency and issued its own stamps. This period was a major turning point for the fortunes of Chania, a time when it re-established itself as a cultural, intellectual and cosmopolitan centre, once again able to flourish due to its wide range of western and eastern influences. A large number of new buildings of a Neo Classical design were constructed during this period. Venizelos tomb stands on a hill overlooking Chania. Chania's long and distinguished history saw further huge developments when it was invaded and occupied by German forces during the Second World War (WWII). Much of Chania was bombed in 1941 during the Battle of Crete. Persecution of the local population ensued as German soldiers retaliated against the resistance by the Cretans to their rule with executions and imprisonment commonplace. In 1944, the Jewish population of the city was rounded up by the Nazis and shipped from Crete. Their ship being part of the German fleet was a target of Allied bombing and was torpedoed and sunk by British forces. Todays Chania is the culmination of all these historical periods which have each contributed to its unique nature and which make it a very popular and interesting city to visit.